Mark any hazardous waste drum or non-bulk container. DOT rules require that you include essential information like the shipper's address, a tracking number, and EPA number. Labels should give contact information for the police, a public safety officer, or the EPA. • Drum-grade and tested vinyl as well as affordable paper. • To save time and enhance readability, order preprinted labels. 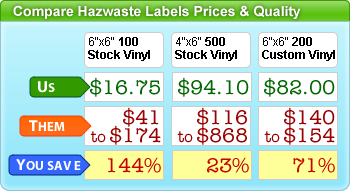 It’s easy and economical to order custom hazardous waste labels. 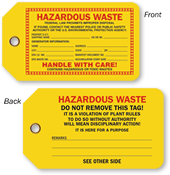 • We also offer free printable hazardous waste labels. Design online, download a PDF, and print yourself. For free! Print Your Own Custom Labels! 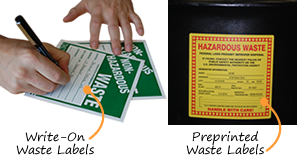 Choose a size and print your hazardous waste label from the comfort of your own office. 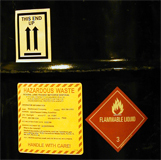 Shipping Hazardous Waste: What Labels to Use? Learn how to prepare your hazardous waste drum for shipping and how to comply with 40 CFR 262.32. Find simple explanations to some complex regulations. Discover six tips on how to design, order and install the most effective Hazardous Waste labels possible. How is a waste accumulation label used? Should I use plastic or paper HazWaste labels? 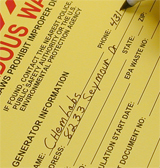 When should I use the Non-Hazardous Waste Label? Find answers to common questions. Sometimes the best way to identify your HazWaste is with a hangint tag, and not with a label. Attach this tag to drum handles, smaller containers or solid waste. As Low As 44¢ per Label! As Low As 12¢ per Label! As Low As 15¢ per Label! As Low As 36¢ per Label! Great job on these. Now hopefully I can get my employees to just complete the date when they affix them to the drums. Sturdy construction, clear printing, timely arrival. Exactly what we needed; straightforward and lots of space for filling in needed information. Easy to read but not too big, works on most containers.